when replying to an email. This usually happens when I am typing a particularly long response, which is especially frustrating since I have lost my message a couple times trying to overcome this error. The error also only occurs with my IMAP emails. 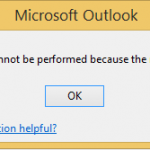 This error appears to have caused by Outlook saving a copy of the email into the “Drafts” folder which is then out of sync with the reply in the inbox. If you are fast with your replies before the autosave to the drafts folder this issue will not occur. 2 – Select the “POP OUT” button to open a full windowed version of the reply. Then click the “SAVE” disk at the top left. This seems to get the Draft and Inbox version in sync, which will then allow you to send the message without the error. Oddly enough there doesn’t appear to be any way to access the “Save” option for the message when using the new embedded reply feature. I’ve experienced this issue across multiple systems to varying degrees and on at least 2 systems the root cause was the antivirus add-in re-scanning messages after they had been downloaded which was triggering the “message has been changed”. Disabling the integrated Antivirus plug in resolved the problem. In the case of ESET antivirus disabling the “Repeat Scan after Update” option in the ESET tab in outlook solved the issue. A note that the most recent version of ESET (version 7.0.302.26 and higher) appears to have resolved the issue reported above and is not triggering the “message has been changed” error. This didn’t work for me. I press save disk and I get an error saying this item is no longer valid. I have had this issue as well. If you go into the Drafts folder you’ll find a copy of the message. If you open it instead of the original email it should allow you to edit and send the message. This response was very helpful. I have not lost an email yet but I have to take the time to copy what I was going to send in the Reply and then paste it in a new Reply and then remember any attachments I had done earlier. Thank you! I have seen the Eset Outlook Add-in cause this issue. Once disabled it worked. My issue was more towards moving a received email to another folder. go to control panel, click on mail, show profiles, and add a new profile. 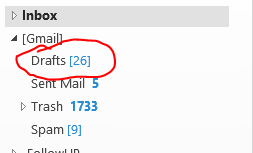 you add a name and create the same mail account with which you were encountering problems with drafts messages trapped and unlikely to be sent. after creating the account, go to mail in control panel, click on show profiles and tick to prompt for a profile to be used. this is also funtime for imap, I just close my outlook and reopen it. *this happens to me when I use my GTD plugin…. (trying to file an email after reading it … imap).